With President Pranab Mukherjee voicing his objection to the 'ordinance route', senior ministers met here on Tuesday to discuss how to ensure that the ordinances issued recently are followed up with legislative action in the upcoming budget session in February. 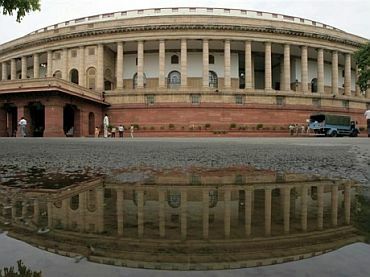 The meeting called by Parliamentary Affairs Minister M Venkaiah Naidu and attended by Home Minister Rajnath Singh, Finance Minister Arun Jaitley and six others deliberated upon the implications that some sectors like coal will have if the ordinances are not followed up by passage of bills in Parliament. The government has issued at least eight ordinances including one on raising the FDI limit in the insurance sector from 26 per cent to 49 per cent and e-auctioning of coal mines. The meeting significantly took place a day after the President voiced his objection to the 'ordinance route' used by the government and cautioned it against it. The meeting discussed issues involving procedures to be followed for replacing ordinances with bills and the preparatory measures in the coming session in Parliament likely to begin in the third week of February. The meeting took note of the possible implications in the event of some of these ordinances not backed up by bills in Parliament. For example there will be a problem in auctioning of the coal mines if the coal ordinance is not replaced by the bill. "I held and informal meeting with my cabinet colleagues and about nine ministers were present along with their secretaries to discuss about the procedures to be followed bringing bills replacing ordinances like insurance bill that is pending, coal bill and also mines bill, land acquisition bill and citizenship amendment bill," Naidu said after the hour-long meeting. "We discussed these bills threadbare. I apprised them of the procedures to be followed, the earlier precedence and also the need to give advance notice before hand and getting translated into both languages, circulating copies etc," he added. Naidu said he tried to "familiarise them with the procedures and ask the secretaries to be ready by the first of the next month. That was the purpose of the meeting today." Coal Minister Piyush Goel, Rural Development Minister Rao Birebdra Singh, Agriculture Minister Radha Mohan Singh, MOS for Surface Transport Radha Krishnan, Steel and Mines Minister Narendra Singh Tomar, Law Minister Sadananda Gowda and all senior officials of the concerned ministries were present in the meeting. As per the rules, an ordinance has to be converted into legislation within 42 days of commencement of Parliament session else it lapses and an ordinance can be repromulgated only three times. Defending the issuance of ordinances, the parliamentary affairs minister said these were promulgated in the interest of the nation as there is a need for creating a favourable climate for investment. "The government is aware of the constitutional provision of issuing ordinances and converting them into the bills. Some of these bills are already passed in Lok Sabha and they are pending in the Rajya Sabha," Naidu said. Taking on the opposition, he said Rajya Sabha could not function because of its attitude and the bills remained pending. "We need to create a climate favourable for investment. Without investment you cannot have growth. You have to recover from this economic sluggishness which requires investment. Investment brings in economic activities that generate jobs and general prosperity and that will lead to the growth at the end of it,” he added. "Keeping that larger and noble objectivity in mind we are compelled to go for ordinances. Ordinance is not a routine thing. It is an extraordinary situation created by some of our opposition parties by not allowing Parliament to function particularly Rajya Sabha. That has necessitated issuance of these ordinances," he said. He said the government is ready for discussion and debate in the House on any issue. "Unfortunately for the reasons best known to them (opposition), they did not allow the Upper House to function on some flimsy grounds." He said there are 12 stages involved in converting these Ordinances into bills. "They (participants in the meeting) were made aware about these 12 stages and told to prepare the bills by February one." Naidu said a meeting of the Cabinet Committee of Parliamentary Affairs has been called tomorrow to discuss about the budget session and its schedule. "You need to give 15 days' notice to the members to send questions. We will discuss the possible and probable date of the budget session in the meeting," he said. Appealing to the opposition to respect the people's mandate, Naidu said because of the clear mandate after a gap of 30 years, Lok Sabha is able to approve bills after thorough discussions. "So it is incumbent upon Rajya Sabha (where the ruling National Democratic Alliance is in a minority) to discuss and debate. Instead they (opposition) are blocking the House and not allowing it to function. That is a peculiar circumstance for which Ordinances were issued." Hitting out at Congress for saying that the NDA government has resorted to ordinances and "our regime is an ordinance regime", the parliamentary affairs minister said 637 ordinances were promulgated during the last 62 years and particularly during the Congress rule. "It means 11 ordinances per year," he observed. Naidu said even the first Prime Minister Pandit Jawaharlal Nehru got brought 70 Ordinances and Indira Gandhi brought 77 Ordinances during their tenures. Rajiv Gandhi was responsible for 35 Ordinances while P V Narasimha Rao got 77 Ordinances issued. "Congress is ignoring such a record,” he said. Targeting the Left, he said "CPM-backed United Front government passed only 61 Bills during its tenure of 1996-98 but issued a record 77 Ordinances at a strike rate of more than three ordinances per month. Now they are talking of stalling Parliament against resorting to ordinances by our government."